I'm NOT Disordered: Four HUGE Updates!!! I think that for at least the last month now, I've been having difficulty in... Making things happen, I guess? It's hard to describe it because I feel like I do have the motivation; I do want to get up and do these things, I just... Don't. I guess procrastination is the right word... It's been - and still is - really frustrating because I'm having all of these ideas and inspiration and I'm just not getting them out there for you guys. I've been vlogging a lot but I know that if it weren't for I'm NOT Disordered and you awesome readers, then I wouldn't be where I am; I'm a Blogger. And so, not putting posts up for a while makes me feel like I'm doing you all a disservice and I worry that the reader numbers will dwindle. And even though the number has continued to rise without a lot of new content, and you guys probably don't feel the way I worry that you do, I still feel the same. It's one of those things where no one can convince you otherwise. And so, I'm sorry. BIG Mental Health Changes !!!EXCLUSIVE!!! I'm actually surprised at myself for not spilling this news sooner - it's not even on my private Facebook!!! That, is how exclusive this is!! So, first BIG change... I no longer require antipsychotic medication! And for the first time in seven years!!! 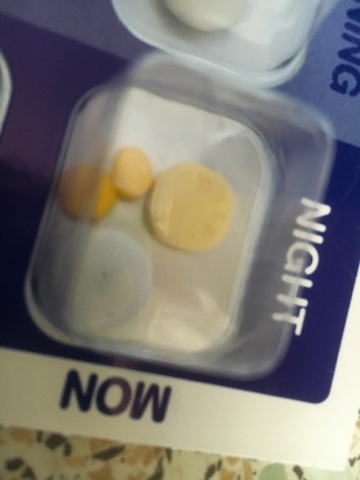 As with most medications it had to be slowly decreased but when the day finally came that I picked up my dosette box and there was NO Quetiapine in it; it was still a shock! SECOND BIG change... 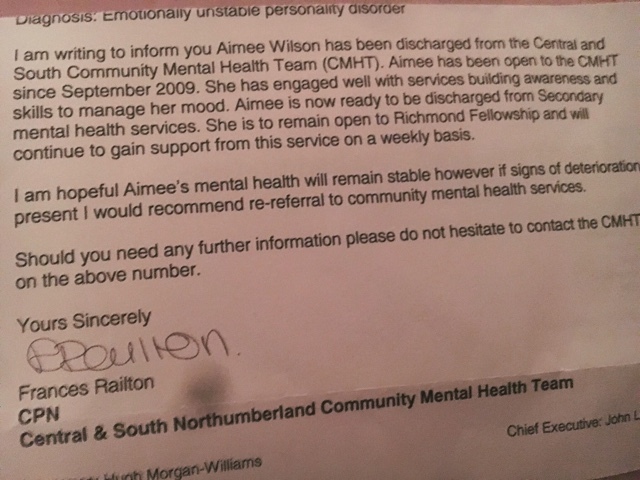 I am officially discharged from the Community Mental Health Team; whose care I have been under since 2009! It's been one of my recovery goals for a very long time and so it was at my request; so we did a trial-run for six weeks to see how I would do without them. The thing is, a big reason for me wanting to be discharged, was that I didn't feel as though I was benefiting from the Team; I only had a Psychiatrist to monitor my medication, I never needed to call them for support with a current situation, and I barely knew, or saw, my CPN. And the fact that everyone has supported the discharge - and particularly my request of it - has reassured me that it was the sensible and responsible thing to do. The most recent struggle has been experiencing my first fall - difficulty with mobility and balance are two of the more debilitating symptoms. I decided to vlog myself just after it, when I was crying hysterically because I was so scared and I just needed to voice those fears. After the fall, I've seen an Occupational Therapist, who has provided me with many aids to use so as to keep my independence. And it all made me cry because there'd been some things that I'd just accepted I could no longer do. However, the sheer amount of tools I've been given, and the size of some of them, has made for a lack of storage and having such equipment in my home has started to make it feel less like a home, and more like a Hospital. I've also been allocated a Social Worker who's organised personal alarms, key safes and carers; so that I can feel safer in my home. And the new painkiller, that's more effective in MS patients, is working so well that on good days, I can walk further, and for longer, without using my walking stick. For me, that's a very good thing, because I get so paranoid when I use my stick in public; it makes me feel as though I stand-out for using a walking aid at my age. I'm working on it though!! Dolly has completed her trial month of medication and I saw changes in her on day FIVE (It's usually not until three or four weeks!) and so she's taking another month of the same dosage and then it's likely we can start reducing them! The changes have been so so lovely! 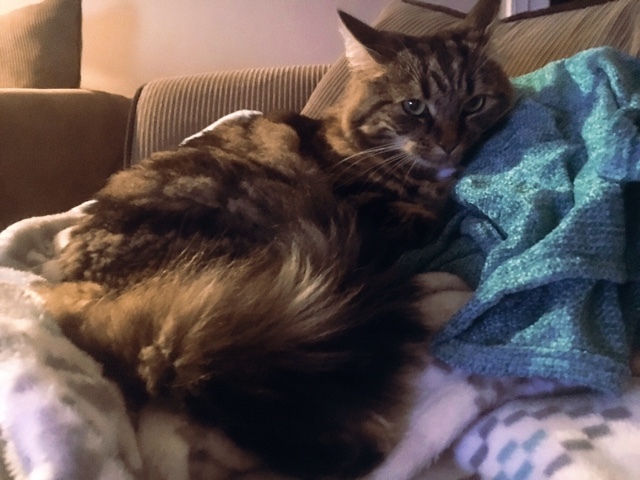 She's being so much more friendly; with less aggression towards visitors and is now bestfriends with the granddaughter of my next-door-neighbour. I've also been allowing her more freedom to go out and come home whenever she likes and it seems to really be improving her confidence.